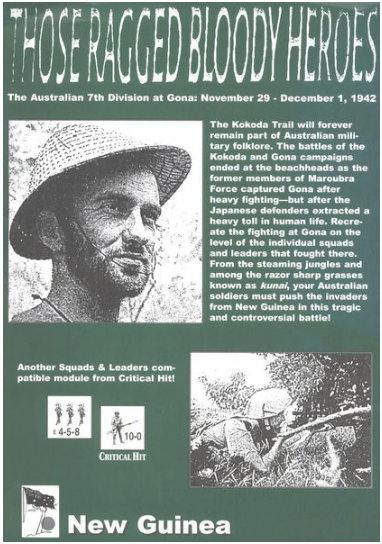 Named after the famous book by Peter Brune (Allen & Unwin, Sydney, 1991), billed as “a book for all Australians”, TRBH brings you into the impenetrable jungle of New Guinea as your men of the Australian 7th Division do battle with the starved but tenacious Japanese defenders of the 41st Infantry Regiment dug into the Gona Mission. A gorgeous map depicting the palm-lined coastline of New Guinea, special rules, play aids, Platoon Leader campaign, and four scenarios round out this ground-breaking module. Designed and developed by Australians Paul Haseler and Mark McGilchrist.